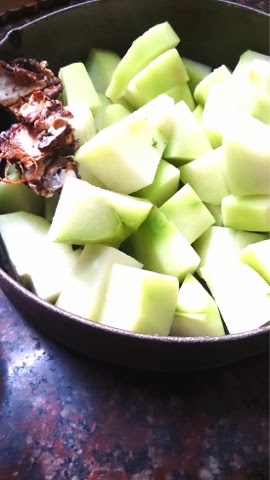 Chayote is popular in South Indian cuisine. It is popularly referred to as “Bangalore brinjal (Bengaluru vankayya)”, called in Kannada as “seeme badanekai” – brinjal/eggplant/aubergine of the plateau. It is used in vegetable stews like “sambar” and “palya”. In Tamil cuisne it is popularly used in various kootu recipes with lentils , and also as tasty chutneys / thogayals . In Tamil Nadu in South India, it is known as “chow chow” and widely used in everyday cooking for “sambar” or “kootu”and sold in vegetable markets in the name of “chow chow”. 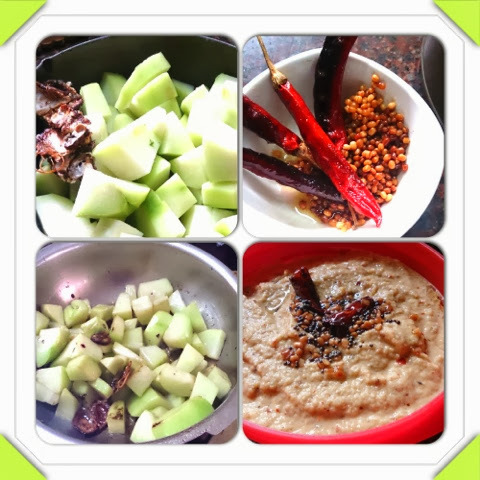 Here I am sharing two ways of making chow chow chutney . 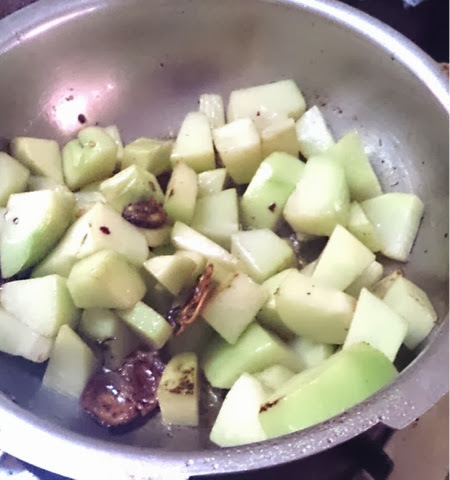 The video has been recently uploaded and the post updated with another version of making chow chow thogayal or chutney . 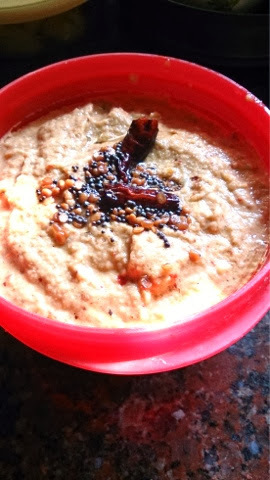 This togayal is very tasty and a great replacement to coconut chutneys as an accompaniment for South Indian dishes like idlis , dosas and a great chutney to mix with rice and have with papads . Take a deep pan, add 2 tbsp sesame oil and sauté the cubed chopped chayote / chow chow pieces. Add the pinch of asafotida powder. Add the small ball of tamrind too while sautéing as it will soften it a bit. When the chow chow pieces look softened but firm , take it off the flame and keep aside to cool . 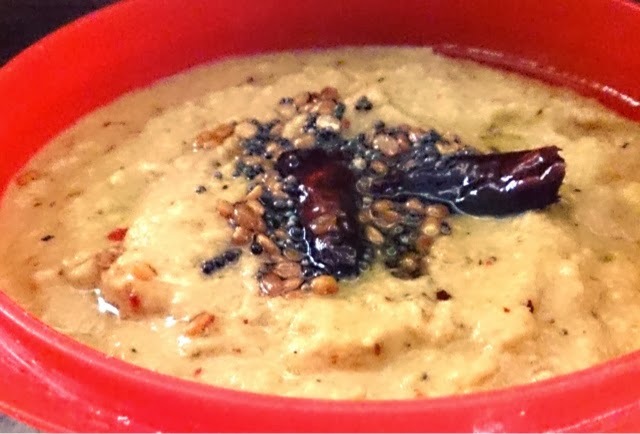 In another small pan add a tsp of sesame oil and fry the udad dal and red chillies till the dal turns golden and aromatic . The red chillis should be one crisp. Then add the sautéed chow chow/ chayote pieces with the softened tamrind , salt to the powdered hdad dal red chilli powder and continue to grind everything to a paste without adding even a drop of water! Reason being chow chow has lot of water in it and will release it while grinding . Another reason is the togayal will not spoil if no water is added. 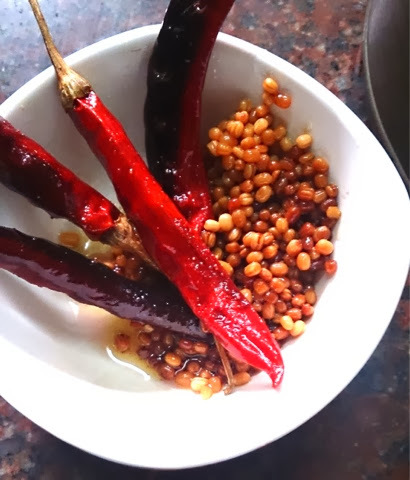 When the chow chow togayal is nicely ground to a paste , remove and then prepare a tempering by crackling mustard seeds, adding 2 small red chillis in a tsp of sesame oil and pour the hot tempering over the ground togayal and stir well. This makes an excellent accompaniment for rice. 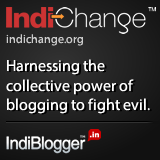 Especially curd rice, with idlis and dosas, or simply mix with rice and eat. Chow-chow is rich in amino acids and vitamin c. Chow-chow can be used to make sambar, kootu and poriyal. Most parts of the chayote are edible; the starchy tuberous parts of the roots are used like potatoes, the shoots as a pot herb, the young leaves as spinach or as a medicinal tea, the fruit as a vegetable and the nutty stones inside the fruit are prized by cooks. The fruit does not need to be peeled to be cooked or fried in slices. Both fruit and seed are rich in amino acids and vitamin C. Fresh green fruit are firm and without brown spots or signs of sprouting. Smaller ones are more tender. The leaves and fruit have diuretic, cardiovascular and anti-inflammatory properties, and a tea made from the leaves has been used in the treatment of arteriosclerosis and hypertension, and to dissolve kidney stones a popular seasonal dish for the holidays. While this vegetable doesn’t stand out with any one particular nutrient, it gives you almost all you need in the right proportions. That said, the Chow Chow is high in fibre, making it good for digestion. It contains about twice the potassium and Vitamin C as the average cucumber.